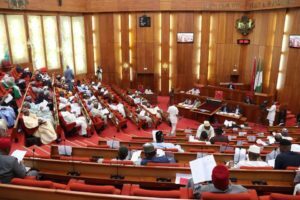 Senate Thursday resolved to probe the alleged illicit and excessive charges by the commercial banks imposed on their customers. The upper chamber also mandated committees on banking, Insurance and other Financial Institutions and Finance to summon the Governor of the Central Bank, Godwin Emefiele to appear before it for explanation. It affirmed that Emefiele would explain why the official charges as approved by the CBN are skewed in favour of the banking institutions as against the ordinary customers of the banks. Also, it urged CBN to suspend the ATM Card Maintenance Charges being deducted from customers account pending the outcome of the investigation. This development followed a motion by Senator Olugbenga Ashafa representing Lagos East. In his lead debate, Ashafa pointed out that there have been several complaints from Nigerians about the excessive charges by Nigerian commercial banks. He explained that CBN in 2017 increased the maintenance fees charged by banks in debit and credit card maintenance from N100 a year to N50 per month (N600) a year as contained in its “Guide to Charges by banks and other financial institutions”. The lawmaker also noted that card users are still charged N65 per withdrawal from the ATM, after the third monthly withdrawal from an ATM outside that of the domicile bank of the said ATM user. Further, Ashafa worried, ‘Most banks have deliberately manipulated their ATM machines not to dispense more than N10,000 per withdrawal in some cases and in most cases not more than N20,000 per withdrawal at the ATM. “That this is a deliberate ploy to manipulated the ATM machines which are ordinarily manufactured to dispense as much as N40,000 per transaction, in order to attract more bank charges from customers who are forced to carry out more transactions due to the manipulated machines”.